A topic that is always debated is which cargo option is better – the bicycle or the tricycle? The answer depends on what your needs are. Below, we break down the advantages of each option, so you are more informed when making your decision. Lighter: With a smaller box and frame, the weight of the bike is less than a 3-wheeled option. Faster: Less weight and less friction from a third wheel allows for an easier and faster ride. Cornering can also be done at a higher speed than on a 3-wheeled cargo bike. Better on uneven surfaces and with road camber: It is a common misconception that a tricycle provides more stability when riding. On an uneven surface or on a slanted roadway or cycle path a 2-wheeled cargo bike provides more stability. Narrow: Most cargo bikes are only as wide as the handle bars of a mountain bike. This allows for the bicycle to maneuver through traffic and tight spaces with ease. Rides like your every day bicycle: The learning curve is low. The wheel base is slightly longer and changes your turning radius, but other than that, the balance of the bike is what you’ve always known. Low step over: Get on and off the bike with ease. This also allows for a large height range for the rider. Balanced loading: There is no need for a kickstand on a cargo tricycle. You can load your cargo with ease and not worry about having an unbalanced load. Shorter wheel base/tighter turning: Cargo trikes generally have a shorter wheel base which allows for a tighter turning radius compared to the 2-wheeled cargo bikes. Are easy to walk/push while loaded with cargo: Having the third wheel to help with balance, it easy to push a bike through a crowd while loaded with cargo. The Wike Salamander offers the best of both worlds for a 2 and 3 wheeled cargo bike. In addition to having all the advantages of 2-wheels, the Salamander has some advantages that the three wheeled cargo bikes offer. The Salamander has a shorter wheel base than other 2 wheeled cargo bikes on the market. This allows for a tighter turning radius, while also allowing the flexibility and balance that is provided by two wheeled bikes on uneven surfaces. While in stroller mode, the Salamander allows for balanced loading, with no need to have a kickstand. Ultimate flexibility when pushing a cargo bike through a crowd, better than any of the 2 wheeled or 3 wheeled competitors on the market, as the Salamander is the only cargo bike that converts to a stroller. Balanced when stopped or moving slowly: When travelling at slow speeds, a 3-wheeled cargo bike is more stable than its 2-wheeled counterpart. When completely stopped it isn’t necessary to put your foot down to balance the bike. Larger capacity: The width of the front tires on cargo trikes allows for a larger box, increasing capacity and weight of the cargo that can be carried. In addition to the above features, the Salamander is the only cargo bike on the market that includes all the extra options in the purchase price: bug screen, rain screen, front and rear lights, bell, and padded cushions plus many other features. 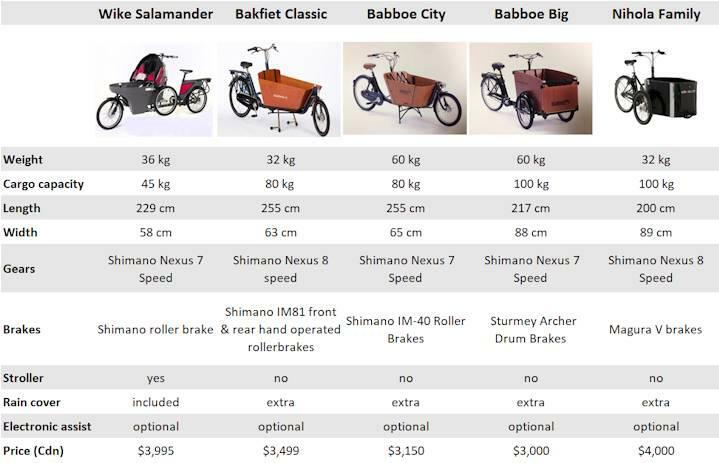 Below is a table comparing the specifications for both cargo bicycles and cargo tricycles on the market.